straight back on to induce a slight drift into position for Reg’s Elbow. 2. Reg’s Elbow Subject to precision positioning exiting Stadium, a fast left hand sweep accelerating through to the Infield Hairpin. 3. 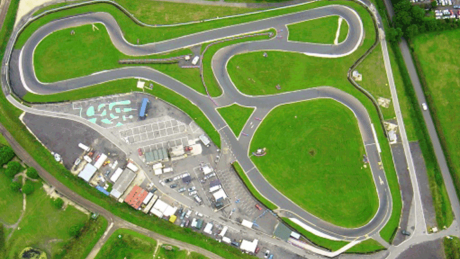 Infield Hairpin Approaching this left hander at “Full Chat”, maximum concentration is required to brake as late as possible, position the Kart and execute this turn smoothly. A good overtaking opportunity under braking. opportunity down the straight. 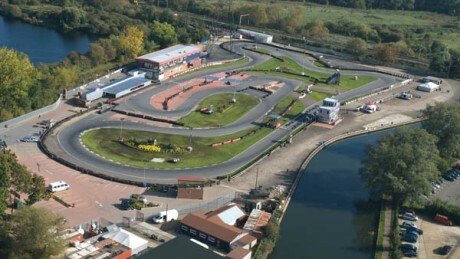 The “Rush” generated from driving this section properly is why Rye House is stilldeemed the Country’s finest racing circuit. The following is a corner by corner account of the correct way to tackle Clay Pigeon in the eyes of CLUB 100 Heavyweight driver, Paul Hicks. Billy’s blind is a very fast downhill left, which is a nice wide-open first bend. Approach during practice flat with no need for brakes from the far right of the track for a perfect line, but during racing a more central line is required to prevent being overtaken. Turn in late to be near to the kerb at the apex. The kart will be thrown wide as you run through the bend. 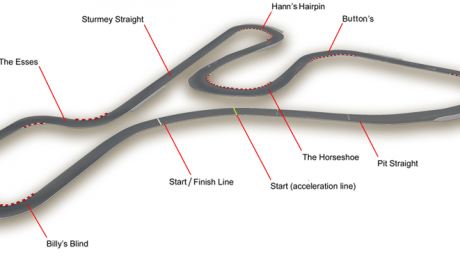 Try to control this so that you leave the bend about mid point of the track. From the fast downhill sweep of Billy’s, move across to the left-hand side of the track for a hard brake. Billy’s blind is the fastest point that a club 100 kart will travel all year into a medium speed double right-hander. The breaking point for this bend is just before the surface change. Turn in holding off the kerbs as they upset the kart, keep the kart within a kart’s width of the inside as you power round to a mid-curve apex. The final exit is wide ready for turn 3. The next bend is now taken almost flat as so much speed is scrubbed off at the previous corner. Approaching from full left, you will hit a slight bump, if taken correctly this set’s you up for a good run through this quick right / left hander. It is important to try and straight line between the right and left kerbs as the exit is critical. Try to be controlled on the power and do not run the kerbs as very are very vicious and will cause you problems. You must be smooth!! After Sturmey straight which is slightly down hill, you need to position the kart on the left hand side of the track, watching for people who have had a better exit from the esses diving up your inside. Just before reaching the marshals post you need to brake very hard before turning in. Turn in following the kerb for the first part of the corner but allow the kart to run the full width of the track on exit to keep exit speed high. Use the kerb on the exit but keep off the grass. 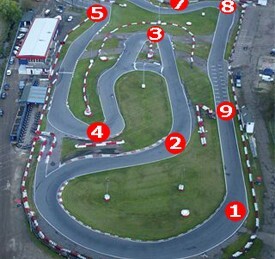 Guide the kart from this full left position to run smoothly across to the right for the next bend. Arguably, the most difficult bend on the circuit. You approach from the full right with a slight dab on the brakes, turning into the kerb at the first apex of this box bend. Exit part one with power on and allow the kart to run to halfway across the track before turning in for part two flat out. Aim slightly off the second kerb where there is a little more grip. When exiting from part two you should not let the kart go wider than half-track as you need to be hard left for the entry to the next bend. This is a conventional 90° right. This bend is approached from the full left and is taken flat out. A standard turn in is needed, running close to the kerb, which is flat at the apex. Do not use the rumble strip on the outside of the track, as it is worn out and very rutted. Staying on the left hand side of the track after exiting turn 6, a slight dab on the brakes is needed to settle the kart at the marshals post before turning in just after the arrows on the track. Run round the kerb but not touching it as it upsets the kart getting onto the power halfway through at the join in the track. The fast exit takes you to the left hand side of the circuit making sure you use every bit of the track. Try not to run onto the dirt as it has become rutted over the years and can cause some interesting moments. Its now foot down, as hard as you can push the pedal, for the completion of a lap heading back down into Billy’s blind, the fastest/”fun-est” down hill kink on the club 100 calendar.